Donald Kirk Blackmon (born March 14, 1958) is an American football coach and former linebacker. Most recently he was the defensive coordinator for the New York Sentinels of the United Football League. Blackmon was selected by the New England Patriots in the fourth round of the 1981 NFL Draft. A 6'3". 235 lbs. linebacker from the University of Tulsa, Blackmon played his entire NFL career for the Patriots. He started 72 of 89 games and recorded 541 tackles, 30.5 sacks, and five interceptions before being forced to retire after a neck injury in a game against the Raiders in 1987. 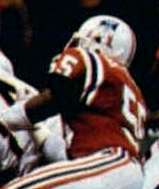 He was on the Patriots AFC title team in 1986. Blackmon was a three time all-conference selection at Tulsa and has been named to the school's Hall of Fame.